Happy gaming everyone! 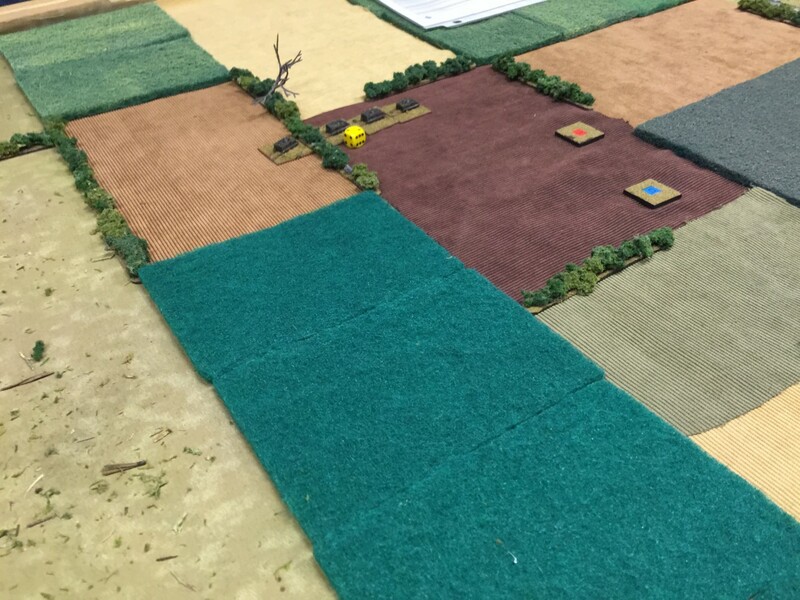 This past weekend we played a game using Battle Captains, our in development company scale combat game. 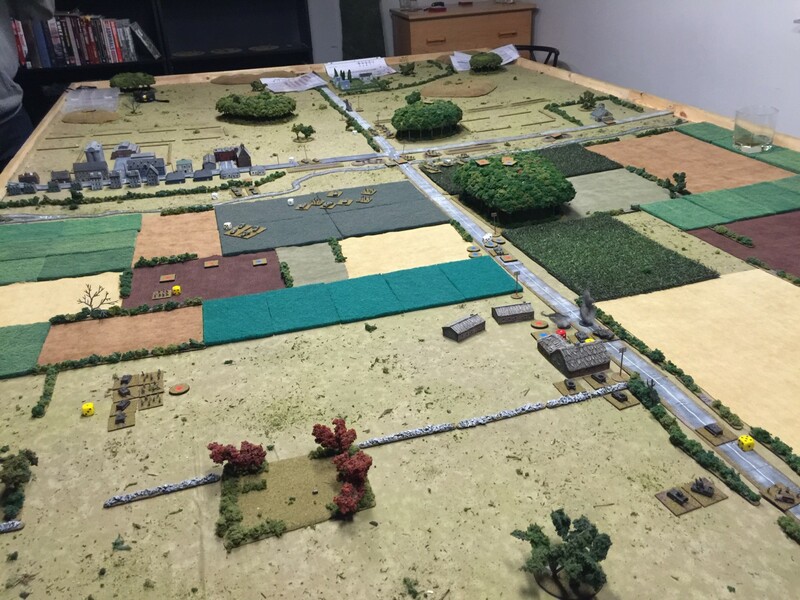 For this game we pulled out the Cold War era models and had a go at a what-if scenario. We chose 1984 as our play year and talked through a scenario involving a follow on push by Category A Soviet forces exploiting the gap created by an East German unit. To make the push happen the Soviet players were given a MRR Rifle Company (BMP) with attached support assets including a platoon of T-80s, ZSU-23-4s, and SA-9s. The red airforce joined in bringing a Mig-25, a Mig-27, and a Mi-24. 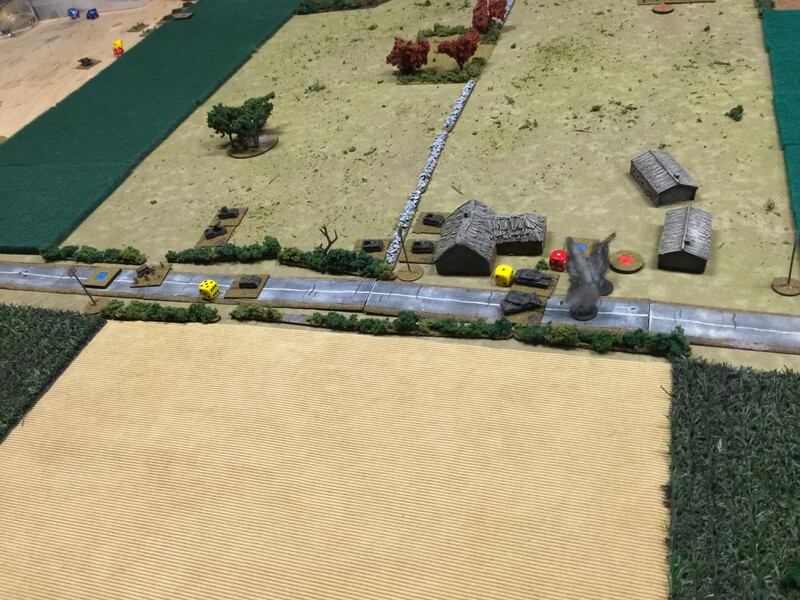 Not to be outdone, the arty boys supplied a battery of 2S1s, a battery of 2S3s, and a battery of BM-21s. This presented the players with quite a bit of firepower to use at the pointy end. 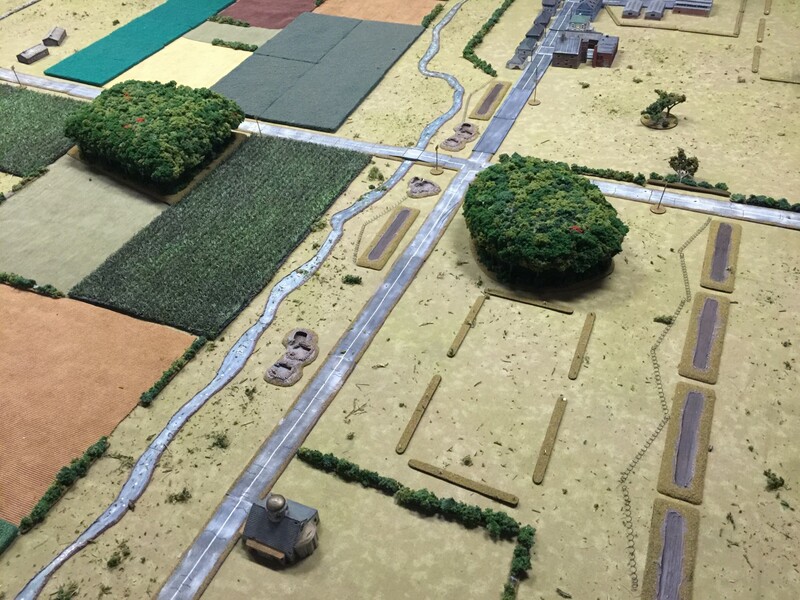 A view from the Soviet side, the defensive positions of the previous defenders can be seen. The old defensive positions included, trenches, barbed wire, minefields, and tank-ditches. 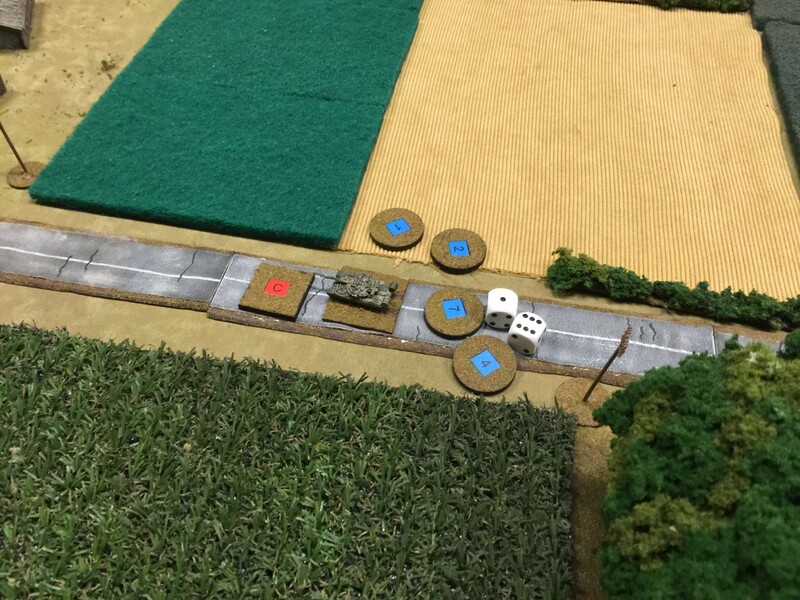 Across the table (and the river in this case) was an American mechanized infantry company with an attached platoon of M1s, and M113ACAVs. The American gunners presented themselves with a battery of M109s and a battery of M198s. In the skies, American pilots drove an A-10, an F111, two AH-1s, and an OH-58. The contrast between these forces is interesting as the Americans are still riding in M113s and appear at first glance to lack in firepower. However, training and discipline should never be discounted and in these areas the Americans are at least marginally better. 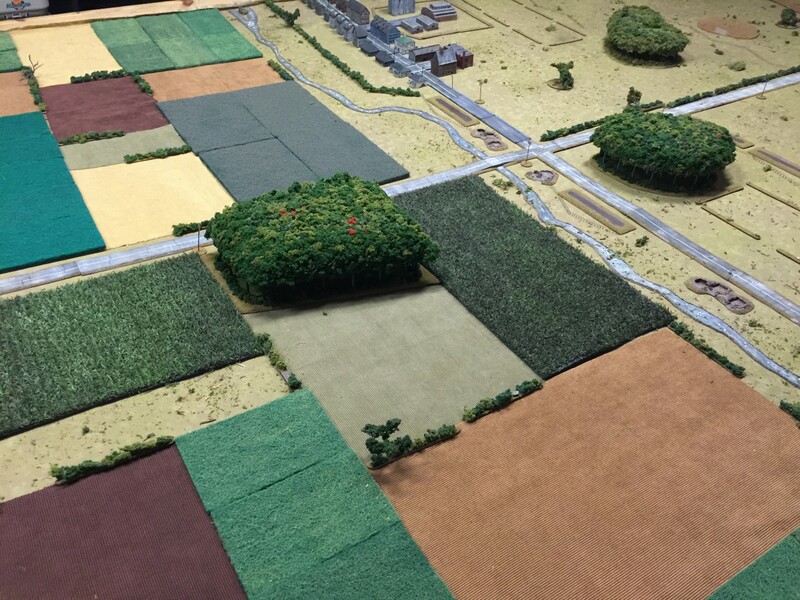 Beyond the river lay dense farmer's fields which restricted movement considerably. 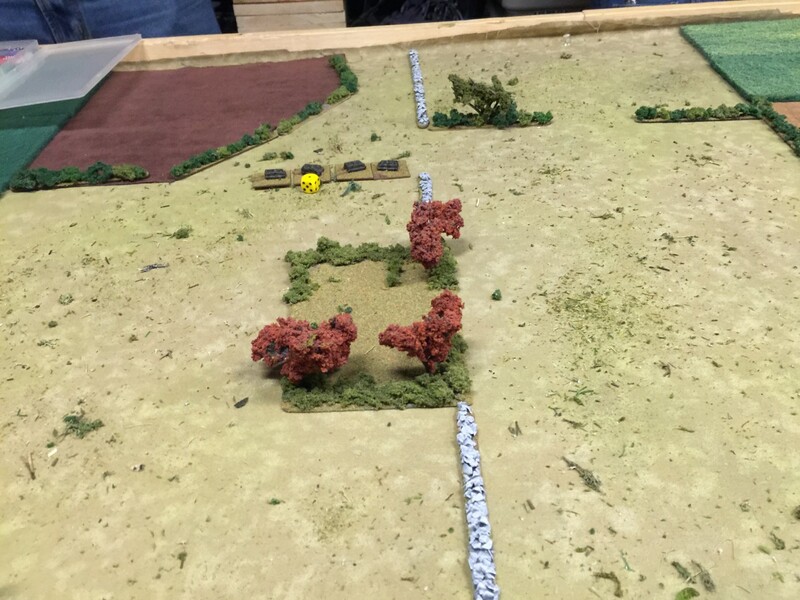 The game began with a flurry of activity on the Soviet side. 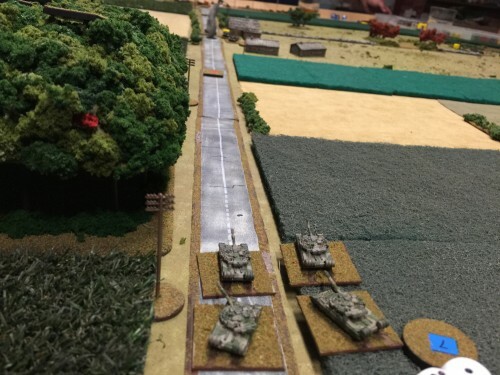 The T-80 platoon raced down the central road, across the bridge, straight past the American Recce, and only stopped when the M1s presented themselves. These two groups of heavy metal would spend the next two turns (a couple of minutes at most) pouring rounds into each other, rendering each other irrelevant. Unfortunatley, the titanic match on the central road seemed to draw an innordinate amount of attention from both sides regardless of its tactical relevance. Meanwhile, the Soviet infantry and support column began its march towards the bridge with the Americans attempting a long left flank with a platoon of infantry. 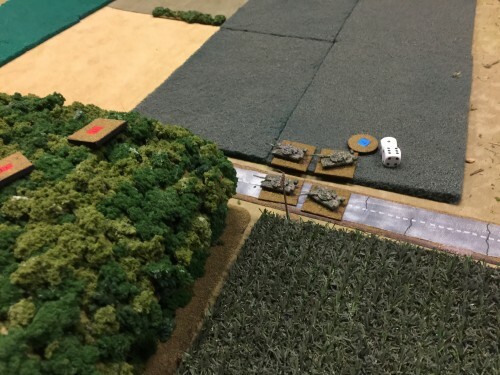 The Soviet infantry begin to navigate their way towards the bridge. 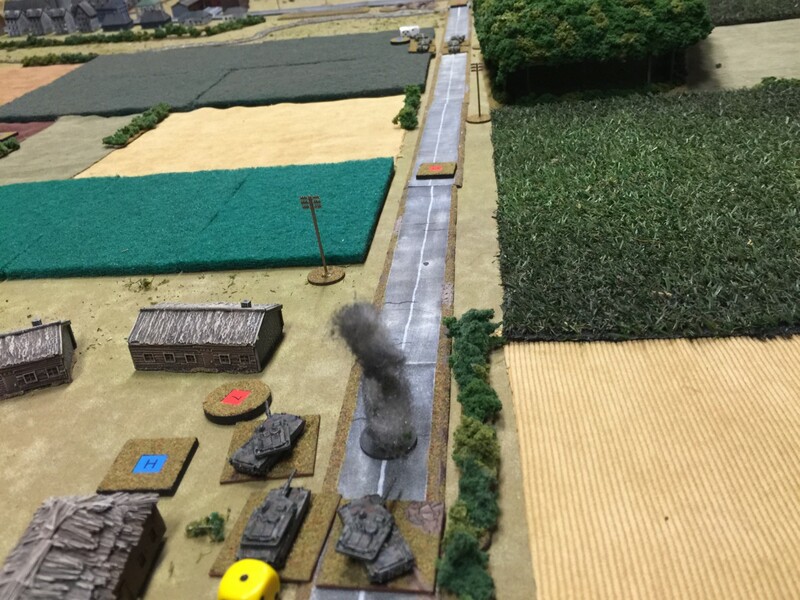 BMPs burn from incoming fire while the remnants of a platoon rally off the road. The T-80s reorient upon discovering the Americans tanks. An M1 burns after the Soviet tanks hurredly fire. 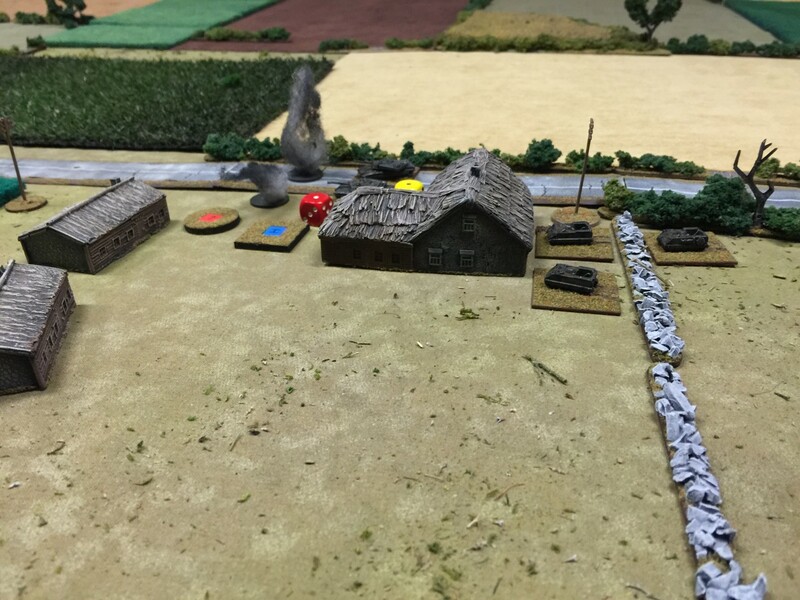 Numerous aircraft darted in and out of the battle with mixed results. The notable moment occured when the A-10 began an end run down the central road towards the Soviet column. At this point the American players noticed that directly along that road were two ZSU-23-4s and two SA-9s. A nervous and sweaty few seconds later the Soviet players informed them that the AA assets were on a high speed move at that exact moment and therefore ineligible to fire at the A-10. 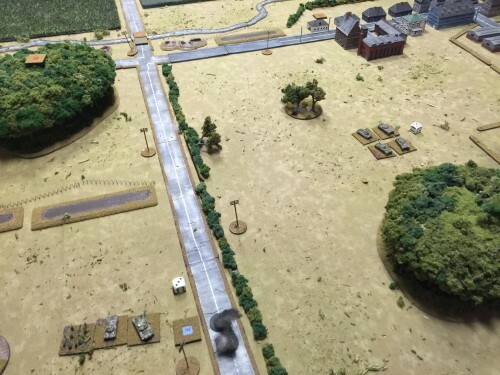 Missiles flew out of the Devil's Cross and a Soviet infantry platoon received serious casualties, was forced of the road, and would stay there for the remainder of the game. The M1s stare down a long stretch of road. An American infantry platoon makes a flanking run. 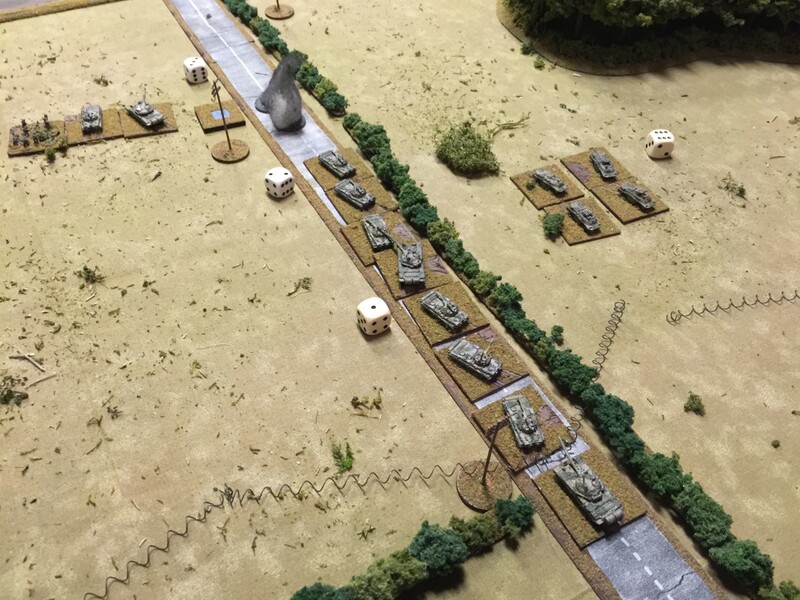 The Soviet column sits far back from the tank fight. 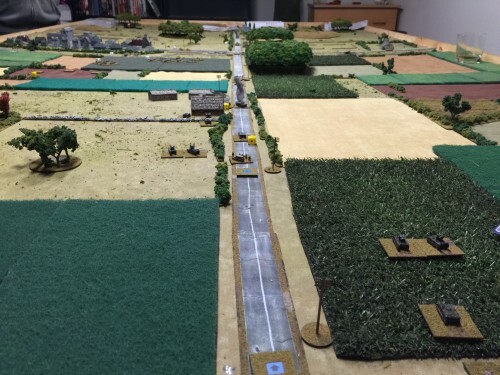 The last turns saw the flanking American infantry platoon caught in a field (rather than the woods they were aiming for) and slaughtered by half the Soviet column with a second platoon being forced to debus out of position as well as a response. 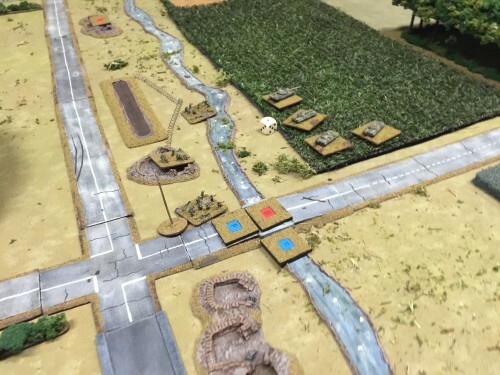 American artillery and aircraft were called in to target the Soviet concentration around the bridge but proved to be a little late as the Soviet column proceeded to let loose like water from a broken damn and threatened to overun the Americans completely. 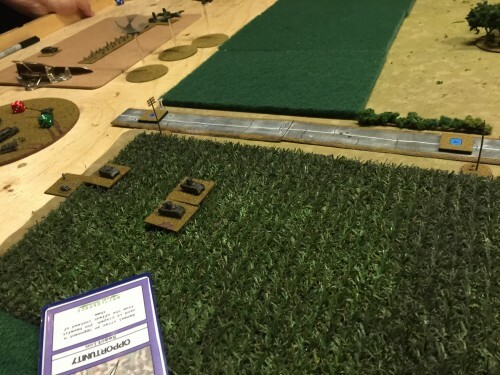 The game ended when the American commander drew his last FUBAR card into his hand and looked up to see a horde of Soviets racing towards France. In response to the Americans flank attempt, a Soviet infantry platoon and an AT platoon break right and slaughter the happles Yankees. After an exchange of high velocity rounds only one T-80 remains. 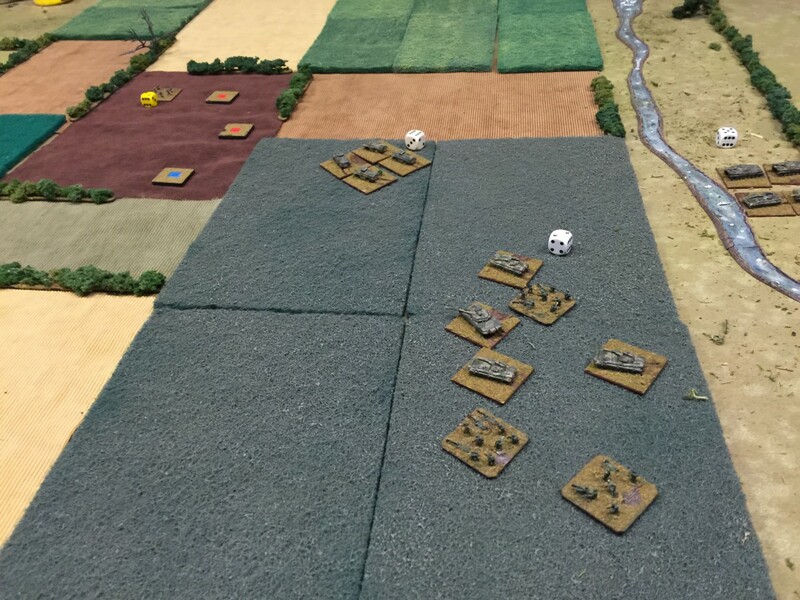 The blue numbers each indicate an American platoon that has engaged the T-80s. 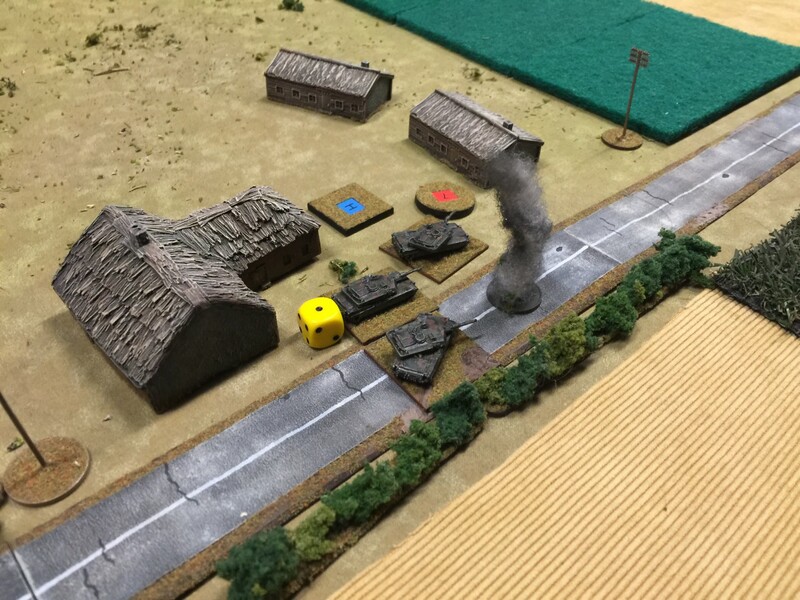 Two M1s burn while a mortar platoon takes position behind the farm. M901s (TOW launchers) are deployed in the crops to provide long range fire. 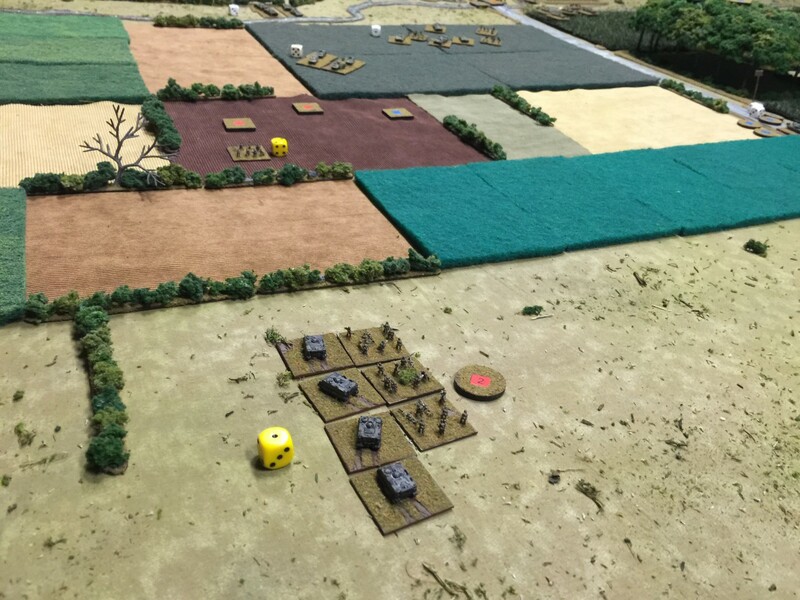 The Soviet left flank is covered by an infantry platoon, with the command group, AA assets, and Recce held in reserve. This game highlighted the differences between the Flexible and Inflexible doctrine decks. The Soviet players used period and army appropriate tactics and were rewarded by a deck that agreed with those tactics. 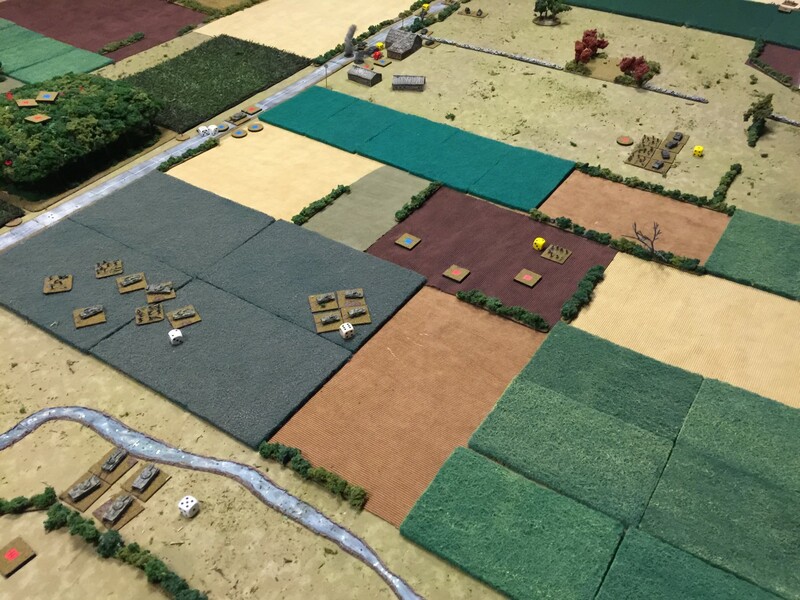 The Americans, unfortunatley, did not use their deck (and ultimatley the right tactics) to its full extent. Whiel the Soviets took considerably more casualties the day was decidedly Soviet. 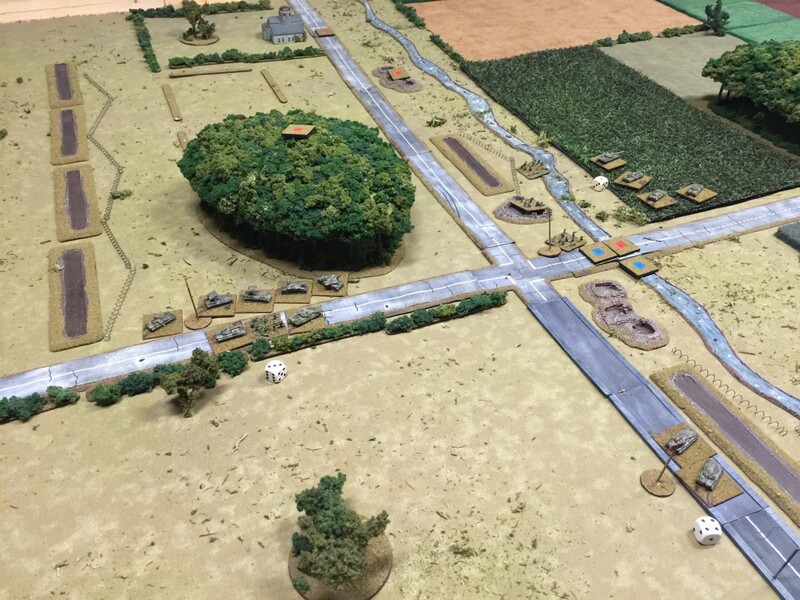 The former NATO defenses have been usurped and passed over by the advancing Soviets. The American left flank has been severely dented. 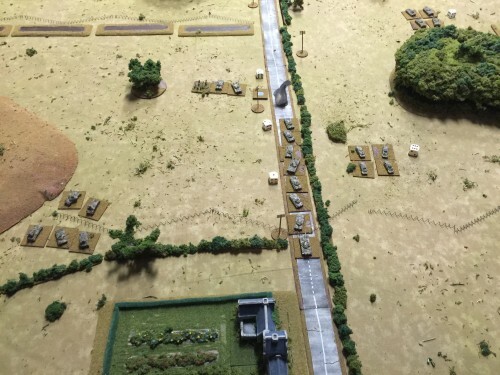 The American reserve infantry platoon has debussed to hold the left flank from any more raging Ruskies. American mortars throw shells at the Soviets. 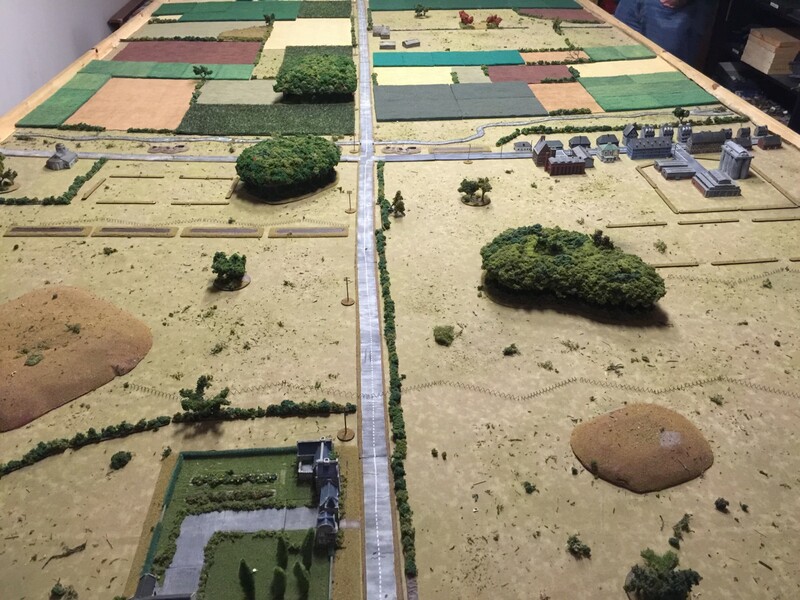 A view from the American end. 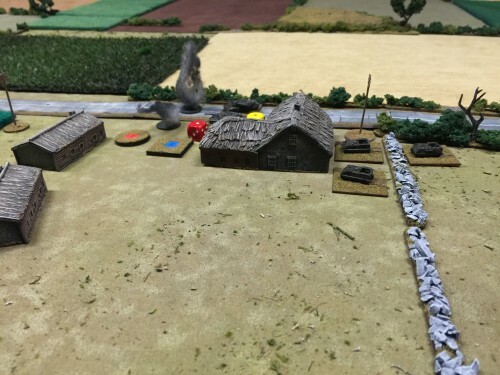 The game ends with the American players realizing they had been reacting the entire game, never a good thing.